Unfortunately, I had nothing left in my model range to fill this void in points. Potentially, I could have taken a Lhamaean, or even another Sslyth, or even just filled out the numbers of some of my Wych squads/Mandrakes/Reavers. That’s hindsight for you, though). The general idea of this list was to keep as many splinter weapons/blasters on hand as possible to deal with Daemon Princes, Bloat Drones, etc, while also having some close combat punch just in case (and, naturally, plenty of mobility). In particular, I wanted to experiment with the Cult of the Cursed Blade and a giant mob of 20 or so Wyches coming out of the webway– I hopefully, they would help deal with the giant unbreakable Poxwalker tarpits I faced the last time around. We played one of the ITC missions, on a diagonal deployment on a table with sparse cover. I was, and still am, completely unfamiliar with ITC missions, but for my two special objectives I chose Monster Hunter and Recon (I think) He chose the character-hunting objective and also Recon. I’ll be honest, my memory is hazy, and I was essentially a casual player up against someone prepping for the ITC. This is only going to be a short-form batrep, partly because my army is still in a partial stage of assembly/painting/renovation, and partly because my opponent needed to be elsewhere in four hours, and I didn’t want to slow the game down by taking pictures. I’ll just instead quickly go over what happened. Before the game, I used my extra command points to give my non-warlord Succubus the Traitor’s Embrace (aka the “kill me and I explode” relic), and my Haemonculus the Helm of Spite so he could counter enemy psykers. We played on a board with a few hollowed-out buildings on either side, with plenty of no man’s land in between. He set up with his forces spread across his deployment zone, with his Crawlers at the forefront and his Blight Haulers, Mortarion, Daemon Prince and everything else sheltering behind them. I, meanwhile, clustered as many skimmers as possible behind the two buildings, with all of my characters going into Wych Raiders, along with the giant Wych blob and Mandrakes in reserve, and the Wracks in the far corner, out of sight and ready to redeploy via Black Cornucopians if need be. I made one serious deployment mistake, however: I one Wych Raider (with exploding Succubus, warlord Archon and Sslyth) far forward on the left flank, along with the Reaver Jebtikes, with both units out of cover and practically staring down the Death Guard’s guns. The reason for this was I was gambling on getting the first turn, zooming forward and assaulting/blastering stuff right from the get go. Guess what? I didn’t get the first turn, and I didn’t seize the initiative. Ahahaha help. His Crawlers all move up, as do his Blight Haulers, with one going right into the face of my Reavers, while his Nurglings all scamper around to grab objectives. Mortarion and his Daemon Prince advance close to the middle of his force, with his Deathshroud staying close to Mortarion to tank wounds for him. The psychic phase is largely ineffective, but shooting is painful: exposed out in the open, 4 of my Reavers go down, as does the Raider carrying the Wyches, Sslyth, explosive Succubus and my warlord. No one is hurt, but now almost all of my stuff is out in the open. My turn, I try to advance my characters for cover, while my Sslyth stands in front of them. My Reavers zoom behind one Crawler, while my Wyches move to assault it next turn. Honestly, on that flank, I pretty much figure its all a lost cause and I’m playing for time. The rest of my army pulls a refused flank manoeuvre, with everything (bar a Ravager and a Venom, which are too far back) flying down the right flank to concentrate fire on another Crawler. I had both my Archon and Haemonculus get out as well, the former to get his reroll 1s bubble in action, the latter to make sure the Helm of Spite was on the board. Shooting sees concentrated fire bring down the Crawler surprisingly quickly– my opponent’s invulnerable and Disgustingly Resilient saves were awful– while random splinter fire kills half a unit of Nurglings (those little blighters are tough!) My Reavers, meanwhile, do 4-odd wounds to the Crawler they were facing. Then, in the assault phase, I commit a blunder: I charged my Reavers into the nearest Plagueburst Crawler, 1) because I figured they wouldn’t survive the next turn, and 2) intending for them to eat overwatch so that the Wyches (and hopefully any surviving Reavers) could tie the big tank up for a turn and deny it its awful shooting. The Crawler’s plaguespitters, however, showed me why this was a bad idea, vaporizing both Reavers in one round of overwatch. I was about to charge in with the Wyches as well when my opponent reminded me that, in 8th edition, units can overwatch as many times as they want as long as they are not locked in combat. I had been working under the assumption that overwatch worked like it did in 7th, where units could only ever overwatch once per phase. Needless to say, this was a rather humbling learning moment for me. The Wyches stayed put, though that gave me no solace considering that I had just wasted the Reavers for nothing. In the Death Guard turn, his stuff shuffled around, with the Daemon Prince leaping right up in the face of my massed vehicles on the right flank, Morty flying up towards my Ravager in the centre, and the rest of his stuff angling for better lines of fire/grabbing objectives. In the psychic phase, he failed to case Miasma on the Daemon Prince, and miraculously failed Smite, but his Herald did manage to heal a few wounds off of the Crawler that had all to recently spat on the Reavers. Mortarion then cast Pestilential Vigour on the Daemon Prince, but the Helm of Spite denied it, inflicting a few wounds on Mortarion via Perils in the bargain! In the shooting phase, though, all but 1 of the disembarked Wyches were blasted down, as was the poor Sslyth. The middle Ravager took the lion’s share of the firepower, and despite me using Lightning Reflexes, it was still dropped down to 3 wounds. In the assault phase, the Daemon Prince charged the Razorwing, shrugged off a crapload of overwatch, and proceeded to shred my poor plane before consolidating into a nearby Razorwing. The damn thing was now right in the middle of most of my army…right, I later realized, where my opponent wanted it. In my turn, the Mandrakes arrived in the opponent’s backfield, while I opened a webway portal and brought my big mob of Wyches in as well. I hoped to use both of these units to clear the backfield of Nurglings. In the proper movement phase, I had no bloody idea what to do with my warlord, as she was surrounded by Crawlers, Mortarion, and the incoming Death Guard, so I hid her, while the exploding Succubus and the last Wych went after Mortarion. The injured Ravager moved more fully out of cover so it could grab a nearby objective. Meanwhile, my big huddle on the right flank…continued to huddle, with my vehicles all circling the Daemon Prince to rapid fire it to death (save for one Venom further back, which zoomed up so that it could shoot at either the Prince or Mortarion). This wound up being a big mistake: instead of using my superior mobility to go out, grab objectives, etc, I was castling in a corner of the board. As it was, my opponent’s more slow-moving army already had control of the board and a sizeable point advantage. As of writing this, I also realize I should have disembarked my other Wych unit + Succubus from their own Raider to go after the Nurglings as well. I really, really wasn’t thinking in this game. In shooting, almost everything that could fired into the Daemon Prince, and despite its 2+ save, 5+ invulnerable and Disgusting Resilience, brought it down to 1 wound with massed poison and lance fire. What few shots I threw against the nearby Crawler, sadly, did no damage. The damaged Ravager whiffed against Mortarion, as did my warlord. 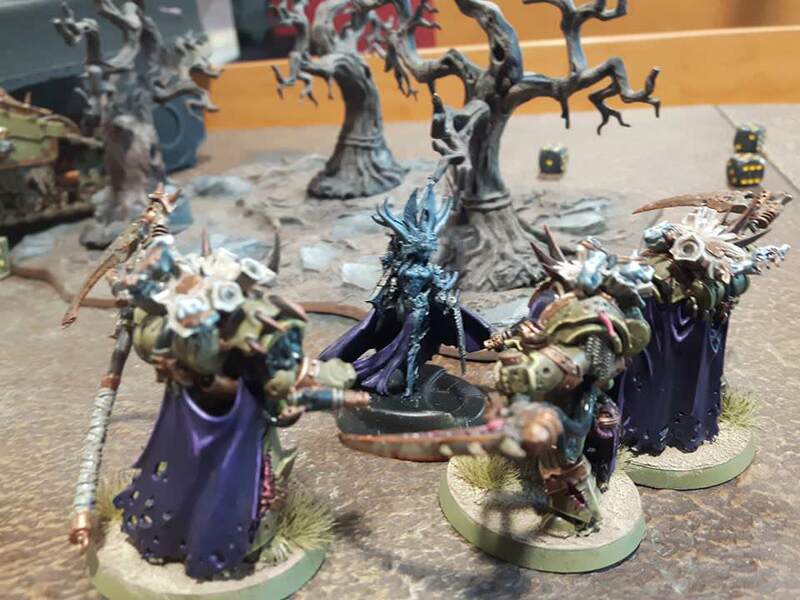 The Mandrakes, however, unleashed their baleblasts at a nearby squad of Nurglings, and managed to kill two bases and leave another hanging on one wound. At the top of turn 3, Mortarion flew down to say hi to my bunched-up vehicles and introduce them to his area-effect plague ability. His Blight Haulers moved back to the centre of the board for better line of sight on my stuff, his Crawlers shuffled…and that was mainly it. Oh yes, and his Deathshroud advanced up menacingly on my warlord. In the psychic phase, the Herald healed up Mortarion, while Mortarion himself managed to cast Plague Wind– I was unable to stop it, and one of my Venoms went crashing down after taking one mortal wound too many, forcing the Kabalites inside to disembark. In the shooting phase, things got even worse: my damaged Ravager went down, as did another of my Venoms, while the Kabalite squad that had previously been forced out was wiped out by missile fire. One Crawler devoted all of its firepower to my nearby warlord…but this time the dice favoured me, as she went on to make save after save with her shadow field, and emerged from the bombardment unscathed. The same could not be said for my big Wych mob, who lost 6 of their number to mortar fire, and another to morale. In the assault phase, Mortarion assaulted, managing to get in contact with my Haemonculus, Archon, and the other disembarked Kabalite squad. Silence swung out in great arcs, slicing down my Haemonculus and all 5 Kabalites. In return, my Archon swung back, and actually managed to ding a wound off of the big guy in return. His Deathshroud, perhaps wisely, declined to charge my warlord after that display of shadowfieldery. In my turn, I withdrew my Archon from combat, and disembarked my Succubus and squad of Wyches to go after Nurglings. Speaking of which, my now-reduced Wych blob moved up to charge one Nurgling squad, while my Mandrakes slunk up towards another. All of my vehicles shuffled to get line of sight on various things, and my Archon warlord moved up to charge either the Deathshroud or the Crawler as necessary. In the shooting phase, my Archon failed to damage the Crawler with her blaster. My Mandrakes, though, did one better, wiping out the Nurglings that they had maimed previously. All the rest of my shooting went into Mortarion, and proceeded to drop the big guy down to 9 wounds! The wound up netting me some points as per Big Game Hunter, so I was quite happy with that. In the assault phase, the big Wych mob went into one squad of Nurglings, the smaller squad went into another, the Succubus went into a third (that had already taken damage from my first shooting phase), and my Mandrakes went into the Nurgle Herald. Finally, the warlord Archon had a choice of dealing with either the Crawler or the Deathshroud, though my opponent warned me that no matter which I charged, the Archon would be receiving a lot of auto-hits on overwatch. In the end, I figured it was either charge or be charged, and sent the Archon into the Deathshroud. The bodyguards of Mortarion then proceeded to unleash a lot of auto-hits from their poisoned flamers, inflicting some 9 wounds on the Archon, of which she saved all…but one, dropping her shadow field. Crap. Everything, at least, made it charge this time. In close combat, the Mandrakes sliced the Nurgle Herald into tiny, rotting bits, ending his psychic shenanigans once and for all. The giant Wych mob, in turn, wiped out two bases of Nurglings and left a third hovering on a wound. Hmm, I was expecting a bit more from them. Finally, my small Wych squad did only to wounds to their Nurgling opponents for two wounds in return, while the Succubus did two wounds to another Nurgling unit and took a wound of her own. Hmm, that was underwhelming. Finally, the Archon swept into the Deathshroud, unleashing 7 strength 4 attacks, rerolling failed to wound rolls and doing d3 damage each…and did absolutely nada, as all of her damage bounced off Cataphractii armour and Disgusting Resilience. In return, the Deathshrouds’ scythes hacked my poor Archon to ribbons. And thus new model curse reared its ugly head. The only picture I took of the game, showing my Archon’s last moments. At this point, though, we were running out of time, and my opponent needed to get going. I can’t remember what the final score was, only that I was losing quite decisively, so I called it then and there. -Looking back, I didn’t do too badly in this game, all things considered. I was, at the end of the day, using a soft list in a scenario format that I was horribly unfamiliar and inexperienced with, and yet I still managed to deal a bloody nose to the Death Guard. Unfortunately, it doesn’t change the fact that I still played a very lopsided game where I pretty much screwed myself over in deployment. -I brought my list expecting to deal with Poxwalker hordes (hence the Wych blob). In retrospect, I shoulder really have brought more Kabalites/firepower, as this would have been a huge help in dealing with those damnable Plagueburst Crawlers, and large monsters, and vehicles, etc. -Nurglings are freaking tough! My Wyches just couldn’t kill the buggers off when it mattered. -My earlier deployment error was extremely costly, and meant that I lost my Reavers far too early. It also meant that my warlord was on the run for most of the game from the majority of the enemy army (in retrospect I wonder if I wound have been better served by running her out aggressively as a distraction rather than trying to preserve her, but I didn’t rate her chances against Mortarion.) Hugging cover is the number one deployment rule for Dark Eldar, and I’m stunned that I neglected it in this instance. -As mentioned above, I was an idiot and didn’t take full advantage of my mobility like I should have. Instead, I let the majority of my force get boxed into a corner for two full turns while the enemy army spread out and took those vital objectives. This was massively important, because in ITC missions you score a point for each turn that you have an objective under your control. -I initially forgot about the Flayed Skull ability to reroll 1s with my splinter rifles/cannons. This was pivotal, as I kept having my vehicles (or my Venoms, at least) hug my Archon’s reroll bubble instead instead of letting them spread out. -My firepower was reliable and effective throughout the entire game, with my multiple blasters punching holes in his tanks and my massed splinter fire putting serious hurt on his Daemon Prince and Morty. My Venoms, Kabalites and Ravagers were all just plain fantastic. -The Wych horde came down on turn 2….and failed their charge on the Nurglings guarding an objective, as did the Mandrakes. When they did make it into a unit of Nurglings on turn 3, they had taken some losses, and only killed 2 bases and nearly killed a 3rd. Not nearly good enough. I think the whole deepstriking Wych blob experiment has failed. -Up until now, i had always thought that overwatch worked like 7th ed, where you can have a unit charge in, eat up overwatch, and free another unit to charge in without penalty. Instead, as I learned, an enemy unit can overwatch as many times as it likes as long as it’s not locked in combat. This became apparent when I charged the last two Reavers into one of his Plagueburst Crawlers, hoping to eat overwatch so some nearby Wyches could lock it in combat and deny its shooting for a bit. Nope, the Reavers died, and the Wyches soon followed suit. -The Helm of Spite must actually be on the table (ie outside of a vehicle) in order to take effect. I’m thinking that for competitive games (ie games where my opponent brings several psykers, Plagueburst Crawlers and Daemon Princes against me), a third Ravager is definitely in order- and potentially, even taking them in a Black Heart Spearhead detachment so that I can make use of Labyrinthine Cunning, Writ of the Dark Muse and Agents of Vect (though I wonder if taking that would immediately turn me into “that guy”). Otherwise, I’m discovering that Reavers are very difficult to use effectively, as despite their high toughness and multiple wounds, they are not hard to kill at all. They really need to hug LOS blocking cover and/or get in the enemy’s faces on turn 1 to be effective– and to do that, ideally, they need to be run with Red Grief, not Cursed Blade. Overall, at the end of the day, I was an unpracticed Drukhari player up against a much more experienced player prepar ing for a major tournament. Based on that factor alone, this was always going to be an uphill battle for me, so I take some solace from that. This entry was posted in Battle Report, Dark Eldar, Warhammer 40k. Bookmark the permalink.